I first read Sam Lipsyte’s novel, Home Land, at the recommendation of a friend. The sarcastic and irreverent story of a man writing out his thoughts to an alumni message board, its a combination of contemporary cultural critique and humorous contempt. Obviously, I immediately bought his next novell, The Ask. Both novels were supremely funny, but also dark. 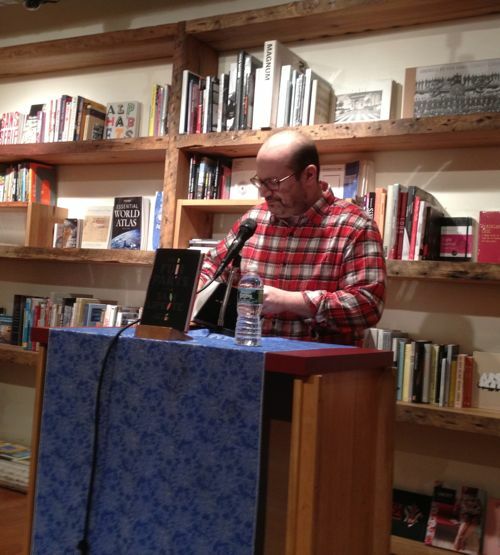 And so I headed out to BookCourt for the release of a short story collection, The Fun Parts. 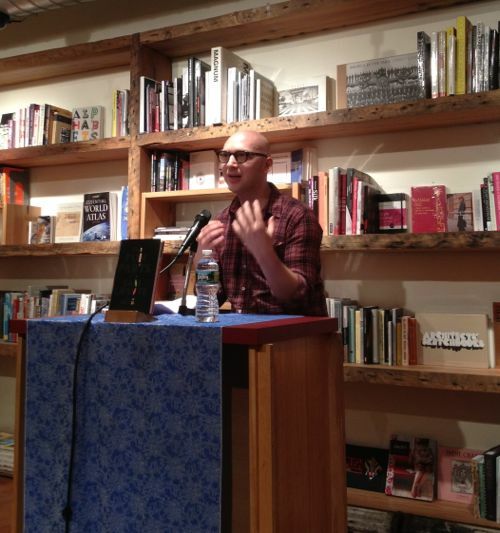 Adam Wilson, author of Flatscreen, introduced Lipsyte to a fully packed room. Wilson has a forthcoming collection of stories with an anticipated release date sometime next year. He served to warm the audience up with laugher, and it worked. He introduced Lipsyte during his last book’s tour and credits himself for Lipsyte’s soaring book sales. Maybe you had to be there, but he was funny. Lipsyte takes the stage and reads, on request, the story ”Nate’s Pain is Now.” The story possesses the dark humor that typifies his narratives and with a polished performance he rises and falls with a superb cadence. Within moments the audience begins a low rumble of laughter sustained until he finishes. The story clearly draws on autobiographical elements, and we hope, exaggerated character flaws and traumas. At one point, the narrator’s father writes, addressing him as “Dear Disappointment.” Its the sort of line that brings the audience to a raucous laughter and simultaneously forces them to all consider maybe they’ve disappointed their fathers too. These are the types of dark truths Lipsyte confronts. He reads another snippet from the “The Climber Room,” the first story of the collection. He he plays with word combinations like “très tref,” to describe scrapple, the south Jersey / Philadelphia delicacy of internal pig parts and waste material that has no other use but processed meat logs. He too implicitly pokes fun of the internet generation co-opting words like “totes” and then converting it into a diminutive character flaw. The internet isn’t spared either and Tovah, a poet, is presumed to have a blog, precisely because she is a poet. Ultimately, all this is to comic effect, and Lipsyte’s delivery of each line has the practice of a stand up comedian. Afterward he asks a question, only to have the audience stare back at him. Finally someone asks what authors he’s been reading and responds with the perplexing answer Christina Hesselholdt, a Danish writer who is seemingly untranslated into English. The audience remains silent. I follow up and ask how he forms his dialogue in a way that suits performance — he was excellent. He explains his first priority is the relationship between the reader and the text, not an audience. Reading for Lipsyte is a solitary experience and despite his skill at delivery, performance seems merely a byproduct of having published a book. Lipsyte is asked about autobiography and the text. He explains there is an inevitable leak of autobiography into any text, but nothing more than a casual relationship exists. Finally, he’s asked to name a few of his influences and he rattles off the following: Stanley Elkin, Philip Roth, and Barry Hannah. He promised he could name more authors too. Adam Wilson dramatically introducing Sam Lipsyte. Also of note, New York Magazine’s Vulture, did a write up.